Callie Gable and I have an op-ed in today’s Raleigh, N.C. News and Observer outlining why we believe that we don’t have enough information to evaluate the functioning of the North Carolina’s ACA insurance market (~500,000 persons in N.C. are enrolled in private plans). What do Callie and I want to see? A population based tracking poll that answers basic questions about persons who are–and are not–enrolled in ACA plans. The Kaiser Family Foundation California Longitudinal Panel Survey is a series of surveys that, over time, tracks the experiences and views of a representative, randomly selected sample of Californians who were uninsured prior to the major coverage expansions under the Affordable Care Act (ACA). 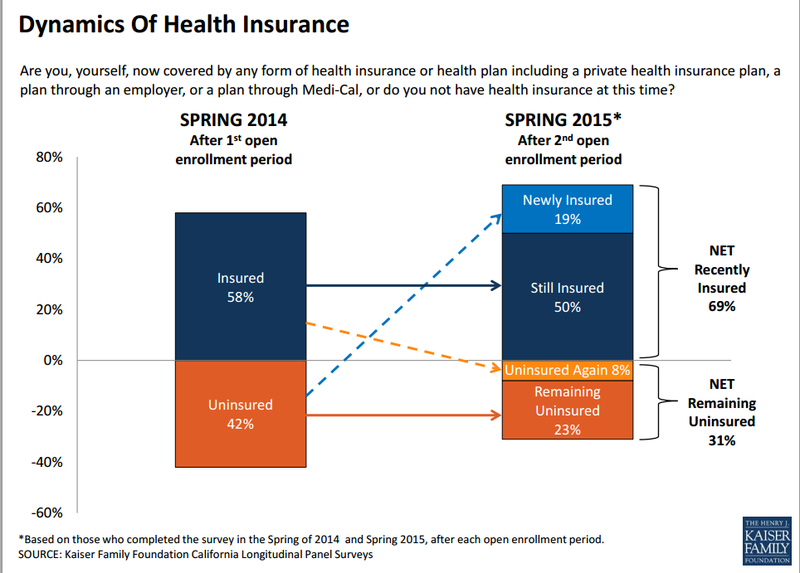 The initial baseline survey was conducted with a representative sample of 2,001 nonelderly uninsured Californian adults in summer 2013, prior to the ACA’s initial open enrollment period…..The third in the series…after the second open enrollment period in spring 2015 to find out whether more have gained coverage, lost coverage, or remained uninsured, what barriers to coverage remain, how those who now have insurance view their coverage, and to assess the impacts that gaining health insurance may have had on financial security and access to care. A fourth survey in the series will keep…The surveys are designed and analyzed by researchers at KFF and the fieldwork costs associated with the spring 2014 and spring 2015 surveys were paid for by The California Endowment. We need to start with the population of North Carolina for whom the ACA exchange is most relevant–the uninsured–and understand their experience (anyone could become uninsured, of course). We can never do what California did which is select a random sample of the uninsured prior to the first ACA open enrollment period and follow them, but we could design a survey of uninsured at a future point plus those now covered in ACA plans and ask them retrospectively about their experience prior to the ACA (imperfect methodologically, but we can only start from where we are now). The key thing to understand is that this starts with the population of California, and then looks at how they interact with the ACA. We need that in North Carolina. What about premium increases for BCBSNC and other insurers? California’s tracking poll asks about premiums, choices and options. For example, you can estimate how important premiums were to those who remained uninsured as compared to other reasons, because they asked people. The thing we most need is a population based understanding of how the ACA is affecting N.C. I wish we had plan level enrollment data by county, on a retrospective basis. If insurer X listed 20 plans in county Y (5 bronze, 5 sliver, 3 gold, 2 platinum), then after the fact say how many people signed up in each plan, in each county. This is the point about a range of premium increases being incomplete information–it is hard to know what they mean without knowing what people actually choose, which is of course a function of the choices they have. Because N.C. has a federal exchange, this information is not released. I wish the federal government would release the data. And as an aside, about a year ago I (Don Taylor, not Callie who co-authored the op-ed) spent some time asking for this plan by county level sign up information, and one federal official told me the State Insurance Commissioner could release the data, but that they could not. Some contacts in the State Insurance Commissioners office told me if was the opposite (feds could release, but they could not). I dropped asking about it, and didn’t make any sort of official request. The big picture questions people have about the ACA are best answered by a population-based tracking poll, so that is where my focus is going. We are actually trying to raise money and develop such a N.C. tracking poll. Let me know if you are interested in being involved–especially if you want to help pay for it! A credible effort will be in the $500,000-$800,000 (per year) range, we think. Chief Justice Roberts saved the ACA again, this time with a 6-3 ruling (Kennedy also joined the liberals) that says that tax credits can flow to persons in states that did not set up their own exchange, but who buy private coverage via healthcare.gov. The case does not depend upon the so-called Chevron doctrine (where the executive branch of the govt is granted discretion when there is ambiguity in how to read a law). Instead, the majority says that because tax credits (and therefore the ability of people to afford health insurance) is such a fundamental part of the law, that the plainest reading of a narrow section of the law couldn’t be read to mean that tax credits are not not available in all states, regardless of the type of exchange through which they get coverage. This is a complete victory for the Obama Adminstration. A reporter just asked me “what does the North Carolina General Assembly need to do now?” Answer: they can keep doing what they have been doing on health care for quite a while: nothing. I hope that they will not continue to do this, and that our state will work out a way to put together a reform of our Medicaid program (that I am in favor of), as well as a means of expanding insurance coverage (that I am also in favor of). Here is a concrete idea for how to do this that I put forth in January, 2014. There have been some statements that they were holding back due to the uncertainty caused by the looming King v Burwell case. There is no longer any uncertainty on that front. A fourth insurer is entering the N.C. ACA landscape; Humana will offer plans in the Winston-Salem and Charlotte areas. Blue Cross/Blue Shield is the only one to sell in all 100 counties. Consumers can choose from 4 insurance companies in some counties, and while BCBS NC remains the dominant insurer, the ACA has increased the number of companies selling indy plans in N.C. In some counties there are 4 choices. This wouldn’t have happened without the ACA. The top line headline has been proposed rate increases, with premium changes across the 4 carriers ranging from a 4.3% decrease to a 40.2% increase. For BCBS NC, increases range from 5% to 32%. Premiums rise when actual costs are higher than expected among the insured book of business, and they vary based on age, where you live, whether you smoke. You can only by insurance based on your own characteristics in the county where you live, so the sensible thing to do is to check out how much your premium would be when open enrollment comes. Premiums quoted in the story are actual premiums, and not what consumers pay. The ACA provides income based subsidies to defray the cost of insurance for persons with incomes between 100% and 400% of poverty. And around 90% of North Carolinians who are covered this year got subsidies, so most will be cushioned against these increases (magnitudes are big; avg NC premium ~$400/month, with subsidy ~$315/month). A key issue will be increasing enrollments of younger, healthier customers, which is key for the long term viability of any insurance market. It is likely that expanding Medicaid would help with the risk pool as well, at least by reducing the uninsured (persons in the so called coverage gap–below 100% and above 0% of poverty if a childless adult–are exempt from the mandate penalty). The company’s chief actuary, Patrick Getzen, said the ACA continues attracting people who had trouble getting insurance in the past: sicker, older customers who tend to run up medical costs. Getzen said 94.2 percent of Blue Cross’s ACA customers qualified for financial subsidies and nearly a fifth of them discontinued coverage after several months. He says “nearly a fifth” of their enrollees signed up, and later discontinued paying premiums. Then he says “most of these” (presumably those who disenrolled) used “costly health care services” before they disenrolled. Several points here. Disenrollment could occur because a person got a job and therefore insurance, transitioned into Medicare eligibility, or bad reasons, like signing up, getting care and then disenrolling. At least there is some magnitude of the number here, but this points out our need for better data with which to evaluate the functioning of the exchange in North Carolina (Nearly a fifth times “most of these” might be 0.18 x .66 ~.12 which when applied against the BCBS NC sign ups of 400,000 would be 48,000 people). A national estimate of disenrollment is that 1.5 Million on a base of 11.7 Million signed up as of February, 2015 which is 13%. It would be lots simpler if we just had good information about how many people disenrolled. in what counties? What were their reasons and/or to what insurance status did they disenroll to (uninsured, Medicare, private, etc.)? And how much care did they use prior to disenrollment? Many important questions. I wish we were collecting better data. Could North Carolina circumvent King v Burwell? re-establish(ing) state control over our insurance marketplace. In fact, most of the pieces are already in place. Our Department of Insurance is proactive about reviewing insurance policies. Our health care and insurance communities meet regularly and could easily form an oversight board. Our outreach and enrollment efforts are national models. All we need is for the governor to work with legislators to vest these organizations with the power to form a state marketplace. I wrote a post last summer asking what does it mean for a state to establish an exchange with respect to the looming Supreme Court case that will determine if tax credits (515,000 North Carolinians have just signed up for coverage and are getting such subsidies) can legally flow to states using the federally facilitated exchange. My post is wonky and complicated, but health policy is wonky and complicated and runs through the various ways that States could move forward on a state-specific exchange. However, I am less certain now than I was last summer that North Carolina could do something in the short run to definitely make the tax credits flowing to our state safe regardless of what the Supreme Court rules (there isn’t enough time to set up all the functions). It is unclear if a simple statement of establishing an exchange and then pointing to healthcare.gov for people to shop for coverage would be enough, in large part because of the uncertainty of what the Supreme Court may say (I know no one who predicted the mix of what they said in 2012). The North Carolina Attorney General Roy Cooper has already signed onto an amicus brief that argues that the actions taken by the State to use the federal exchange was made under the belief that the citizens of North Carolina would be able to receive such tax credits. Even a simple statement of the intent of the North Carolina General Assembly to have the tax credits flow to our citizens with which to purchase private health insurance could prove important, and certainly wouldn’t hurt anything, if our leaders are worried about over half a million North Carolinians losing these tax credits. Following up on yesterday’s post on BCBS NC announcing their ACA enrollment as of May 2, 2014 with a chart. The dark blue bar furthest left is the percentage of the 357,000 enrollees reported by HHS in a given age band. The golden bar (middle one) is the 232,000 persons termed actual enrollees by BCBS NC, and the gray bar to the right is the age breakdown of expected enrollees, per BCBS NC. A few points/observations/questions. Most of the discussion about enrollment has been about the age range 18-34 and worries that there would not be enough of these young persons to balance out the older ones. BCBS says that 25% of their enrollees are in this range but they expected 28%. This is a miss. I am unsure of how big a miss it is in actuarial terms. Our pre-ACA book of business included kids with child-only policies, and many of them were among those who stayed on their pre-ACA plans – which affected the age distribution of our ACA pool. As I asked yesterday, if most of the miss is kids that stayed on individual purchase policies, is this really a big risk pool problem? I have my doubts, especially because those in this book of business didn’t enter via the enrollment rules of the ACA, but I frame this as a question because I an unsure. I am happy to accept and engage answers from BCBS NC or anyone else. Sticking with the 18-34 age group, if BCBS NC enrolled 25%, but all of N.C. enrollments in this age range is 28%, then the other insurer Coventry had to have done better with this age group that so many talked about all winter and spring. If we use the 85% payment rule (though by May 1, 2014 those enrolling as late as April 18 didn’t have to have paid) then that implies BCBS NC has ~273,000 who have signed up, but 232,000 who have paid (assuming this is their actual enrollee definition). If you assume a similar non payment rate for Coventry, then that implies they have ~84,000 enrollees per the HHS definition, and ~72,000 using the actual enrollee definition. They had to have done *much* better at enrolling the 18-34 demographic than did BCBS NC given the much smaller overall enrollment (3 percentage point difference from a base of 72,000 for Coventry v 232,000 for BCBS). A similar story has to be the case for the age 55+ demographic; Coventry had to have done much better, or there is some tremendous non-random payment of premiums that clusters somehow in the 18-34 and the 55+ age range. I don’t see how this is true. For the less than 18 group, did Coventry get lots more of these customers? Was there a pick up of parents signing up kids on employer provided plans to comply with the mandate instead of buying BCBS NC plans? Exactly what percentage of child only plans that ended up being allowed to be sold were resold? Again, I have heard basically no discussion of this group until the BCBS NC press release. Am I wrong? Here is one of thousands of news stories you can find worrying about age 18-34 enrollment, but not a breath about kids. Is there something very different in N.C. as compared to other states? Final question for now. Where do these people live? Will we ever know geographic distribution of enrollees? Are there big enrollment differences by county in N.C.? As always, we need more data. update, 2pm 5/09/14: I talked with Barbara Morales Burke, VP for Health Policy at Blue Cross/Blue Shield of North Carolina. A few points. First, the 232,000 are customers who have paid for their May, 2014 coverage as of May 1, 2014. They had until yesterday to pay for May, 2014 coverage so this number will trickle up. Second, she reiterated that they are not allowed to co-mingle the risk pools of the transitional plans (non qualifying plans allowed to be sold) along with the ACA pools. This is of course true, and will impact 2015 premiums in both pools. But, the true meltdown scenario for an insurer is to pack up and leave a state, and of course that isn’t going to happen as BCBS NC has vast books of business in N.C. outside of the ACA. Third, North Carolina may have more than average “child only” policies than other States because the N.C. State Employee Health Plan does not provide dependent coverage (parents have to pay for premium). Fourth, she does not know if BCBS NC will release enrollment data by county. Such information is very important to target sign ups for next year. 232,000 persons “actually enrolled” as of May 1, 2014. 70% of these 232,000 were not BCBS NC customers in 2013. This is noteworthy since (BCBS NC) is the dominant insurer in North Carolina, with around 90% of the individual market and 70% of the group market. BCBS NC says their ACA customers are are older and sicker than they expected. A question I have: where does the self report health data come from? Not the exchange, which has no such questions. I would like to see more on the methods of how these data were collected. How it was asked? What was the response rate? It is not an illegitimate question, it is just that this sort of data is not collected via the exchange enrollment process. They say that many of their customers who stuck with pre-ACA plans after the administration allowed this were “child only” policies. I wonder if there are similar patterns in other states? It looks like the biggest “miss” between expected and actual enrollment is for these “child only” policies, the type of plan BCBS NC says was the most likely “held over” policy. If many of these expected kid sign ups are signed up in BCBS plans, is that a big risk pool problem? HHS says that 357,495 North Carolinians signed up for private insurance via the exchanges (357,000 – 232,000 = 125,000). Does that mean that 125,000 persons signed up with Coventry, the only other insurer that offered exchange plans? (and they only offered plans in 37 of 100 of North Carolina’s counties?). I seriously doubt that, and suspect the phrase “actual enrollees” in the BCBS NC release is a subset of what the May 1 HHS release has as a BCBS enrollee. However, I don’t know that for certain and cannot find that Coventry has released data. We need better data. The HHS report leaves open the chance that Coventry managed to sign up a slightly younger group of customers than did BCBS NC if you compare the ages released by BCBS NC and those released by HHS, and assume that most of the 125,000 are not just unpaid BCBS customers. For example, BCBS NC says 25% of its enrollees were ages 18-34, while HHS says the N.C. total is 28%. Similarly, BCBS NC says 29% of its enrollees were age 55+, while HHS says that only 24% of those statewide were in this age group. Either there is a big discrepancy between what constitutes “enrollment” in the BCBS NC report v. the HHS report, or Coventry signed up (1) many more customers than I thought they would, and (2) they are substantially younger than those that BCBS NC managed to attract. I don’t know the correct answer. As always, we need more data…. Biggest question. HHS says 357,000 people signed up as of May 1; BCBS NC says 232,000 were “actual enrollees.” How much of the difference is Coventry sign ups? Burwell Nomination: Faint echoes of a deal post ’14? President Obama has nominated Sylvia Burwell to replace Kathleen Sebelius as Secretary of HHS. Burwell is the Director of the Office of Management and Budget and is noted for relatively good relations with Congressional Republicans. She is the type of person who could help broker a deal for modifications of the ACA after the 2014 election. Changes to the ACA at some point are as inevitable as water seeking the lowest point when poured out of a glass. The question is when the politics allow the first deal that can improve the policy? In any sane system, we would have already revisited multiple things, but Republicans have heretofore chosen complete opposition. That may still be their best 2014 election strategy, but they are in dangerous territory of rendering themselves to be post-policy in the most important and difficult long run issue facing our country. As easy and perhaps as effective as repeal blah blah blah is for 2014, I will be shocked if it is anything but a disaster for Republicans in 2016. A smart Republican nominee would want Congressional Republicans and the White House to reach a deal on some modifications. Hillary Clinton likely wouldn’t mind, and the Big Dog certainly would not. And Burwell is a signal that the POTUS wants this as well. What are some relatively simple modifications? Replace the individual mandate with auto enroll procedures plus open enrollment with underwriting allowed if you don’t come in during the enrollment period as proposed by the Coburn-Burr-Hatch policy put out in January 2014. Smooth the “cliff” effect of the ACA exchange subsidy structure by allowing persons with incomes above 400% of poverty to deduct their health insurance premiums. Most people get federal subsidy for their health insurance. We need a rationalization of the amounts and circumstances, but that will take time. This would be a placeholder and would reduce worries about employment effects of high implicit marginal tax rates from the subsidy cliff (that Coburn-Burr-Hatch shares). Replace the cadillac tax with a capping of the tax exlcusion. Coburn-Burr-Hatch initially proposed quite an aggressive cap level, then backed off, but the private score has never been updated. So, they talk up one score, but another policy. In any event, not sure of the level, but capping the tax exclusion of ESI is a better policy because it signals the change to the person getting the now unlimited subsidy–people like me with good employer sponsored health insurance. More complicated, but places I could see a deal going. Provide more routinized state flexibility for states to do a variety of things with the low income portion of Medicaid. States can get waivers and the like as Arkansas is doing for a privatized Medicaid expansion, but this process could be made easier. I would want to be very cautious with changes in the dual eligible and long term disabled portions of Medicaid. We need a way to get the South to participate fully in health reform. Decide what the maximum deductible should be, and create a “copper” level plan that might even simply be financial protection. Such a plan could even be what States auto enroll persons into. I would be open to an explicitly different max deductible amount by age (more for younger, less for older) and seek to get as close to universal coverage as we could. There are quite high deductibles in allowed in ACA plans now. Eventually there will be a deal, just like water flows to the low point. The question is when will the politics be right for some of the things above?